I just realized that this pattern, the Bits of Bullions Bubble, also has bullions on the back bodice. And I haven't even started on the body of the bubble yet. So here I am toiling away on one side of the back bodice. This little candy is made with three strands of pink and two of white. I didn't do too bad a job of keeping the threads from twisting around the needle, but it could certainly be improved. At least it's recognizable as a candy, and that's all that I'm aiming for here. It's definitely better than the lollipop from this post. The little dragonfly is, I think, darling with the choice of colors. It has green stripes on the body which are formed by couching with the green thread, not by mixing the colors in the bullions, thank goodness! The shaping of the wings could be a bit nicer. But that will come with experience. This is my attempt at a posy of flowers with a few leaves. Not bad, except for the yellow, that certainly looks like a redo. The whole arrangement could probably do with another leaf or two. This is the whole of one side of the back bodice. I hope to finish the other side this upcoming weekend. One of the problems with this project is that I have so many colors of threads on different needles going at the same time. For example, a bullion with five threads such as the candy in the first photo takes a No. 3 milliners, along with a No. 10 threaded with white for couching. As I hate to throw away the leftover thread each time I need a new color, I dug out several extra needles to keep on hand in a pincushion. Do you remember this pincushion that I stitched by hand when it was my turn to ride while carpooling? It's perfect for segregating needles in a project. I have, starting with the solid pink top and going counterclockwise, Nos. 3, 5, 7, 8, and 10 milliner's needles. I actually wrote them on the tops of the points with a blue disappearing pen, but it is somewhat hard to see in this photo. I know it is a false economy to worry about a few inches of thread when it costs $0.39/5 meters, but there is also the aggravation and time spent of having to pull new strands and thread the needles. I may get out even more needles, as there's a whole lot of bullions going on here! This is an extremely challenging project as the bullions are so much larger than I've ever made and have to be manipulated in all of these cute shapes. I have to admit that it is fun and somewhat liberating to be able to make these bullions do what I want them to do. I am so used to making very tight bullion roses that this technique seems completely different. I have worked a project by Kari Mecca before I ever started this blog, and someday I'll dig it out, finish it, and show it to all of you. I plan to have several more posts on this project showing the different shapes that I attempt. So to follow this project from the start, just click on the Bits of Bullions Bubble here or on my cloud. As I mentioned in the last post, we had family over for a Memorial Day Barbecue, not on Memorial Day, but the day before, on Sunday. On Memorial Day we cleaned up and relaxed. But on Sunday, the weather was cool and breezy and of course I decided I needed tablecloths on the patio tables. Well, you can imagine what that lovely breeze thought of me and my silly tablecloth idea. So I decided to figure out how to weigh down the corners of the tablecloths and came up with putting some smooth river stones in spice bags and using clothespins to clip the bags to the tablecloths. Then I decided that I could make cute bags from all the fabric I have. I had just enough time to make one fabric bag using some patriotic fabric from my stash. I have to admit, it's a pretty dorky looking bag, what with the loose threads and all. But it did the job and kept the tablecloths in place all during the breezy dinner. Then today, while just hanging around doing nothing, I remembered a post I had seen on Purl Bee about crocheted stones. At the time I thought this just a mite odd, but then today realized that they could be not only cute but functional. I dug out some bedspread crochet cotton, a #6 steel crochet hook, and whipped this little number up in just a few minutes. It's actually pretty cute, and will be especially darling if I did a bunch in red, white and blue for the Fourth. I'll put a loop on the side and clip them onto the tablecloths with a clothes pin. This particular pattern is from the Purl Bee link above, but if you are half conversant in crochet you could adapt any doily pattern to fit around a stone. Obviously I'm not even half conversant in crochet or I wouldn't have that loopy thing in the center. After I make a few I'm sure they will look a bit better. What a lovely weekend it was, but back to work in the morning! I hope all of you (and I) can manage to get a bit of stitching in this week! It's been three weeks since I last posted on this, and I've barely touched it since then. Over the last two days I've spent a fair amount of time gardening, cooking and cleaning up in preparation for the Memorial Day barbecue we are hosting tomorrow. Yes, I know Memorial Day is Monday, but my family likes to not have to drive home and get up to go to work the next morning. So we are having our get together tomorrow. Above is the bodice, only one more bullion to make in the lower right hand corner. All of the photos are lightened up quite a bit, so the mint green fabric tends to wash out a bit. First of all, the easiest. These cherries are simple yet very cute. The are also pretty easy, as the stems are only 10 wraps and the cherries 12. This was also fairly easy as the largest of the petals was 25 wraps, not too bad. The leaves were a bit tricky as they tended to twist after making them so I had to couch them in place with a single strand of thread. The daisies, cherries, cherry stems and leaves were all made with two strands of floss. Now this lollipop was a bit more complicated. It required five strands of floss, three periwinkle and two yellow in a No. 3 milliner's needle with 25 wraps. When working with two different colors it is very important to keep the strands lying beside each other while twisting them around the needle. Actually, this is important with one color as well, but even more so with two colors to give an even stripe to the bullion. You have to keep untwisting the thread as you wind it around the needle. I can see it's a bit uneven, so I may redo this one. I thought that my stick was just perfect, but now I can see the last loop isn't lying quite flat. I patted it a bit with my fingernail and it looks a bit better, but the lollipop portion really does need to be redone. This little worm is my favorite. It's not quite perfect, but not bad. This took 45 wraps! At least it was just two strands of thread with quite a bit of couching to keep the curve in place. That's all I can manage today. Sometimes with something that is fairly difficult, as this piece is for me, I need to work it in relatively small sessions, 1 1/2 to 2 hours at a time. There are some really complicated bullions coming up, insects and birds, which will be really challenging! There will be no time for stitching tomorrow, but I hope to get some done Monday. I hope all of you have a great weekend, and be sure to remember and honor those who died serving our great country. Last weekend I stopped off at my brother's house and no, he didn't give me caramels but something even better! He filled this box with lemon cookies for me to take home.. This box is a very light wooden round box and I knew I just had to cover it with fabric and embroidery! This is just terrible. I've started a new project when I have so many others to finish. But it's so irresistible I'm sure you won't blame me. I'm following a little tutorial on curved piecing by Manya of Humming Needles. You can see her blog on my blog list on the right side of the page. She is really into ribbon embroidery and crazy quilting. Now, I'm not a big CQ fan, but when I saw her work, which is very pretty and not over the top with embellishments, I felt I couldn't resist trying it out. I especially like the curved pieces on a round project. So here is my paper pattern, drawn to fit the top of the box, and cut apart for the fabrics. There are two seam allowances as the first one, drawn on the inside of a circle template, just seemed too small, so I drew another on the outside of the template. The colors are meant to be evocative of a landscape, with green at the bottom for grass and a blue sky. This is definitely a stash project. There's no way I'll buy something new when I have plenty of fabric from which to choose. I've followed Manya's directions for piecing the curves, by basting along the seam line, then folding over and basting the fold before appliquéing to the base fabric. Here I'm on the third piece. I have no idea how to embellish it, but will figure something out in the coming week or two. Manya does mention that this seems to be laborious, but the curves do come out nicely. I once saw a presser foot that made sewing curved seams easy, and maybe some of you quilters out there are familiar with it. But for such a small project hand sewing the curved pieces isn't difficult at all. Remember, this is about the process, not just the finished piece. I started this on Sunday evening, having not even stepped foot in the sewing room all weekend until now. I've been working, and at my day job. Sigh, sometimes you just have to. However, I couldn't resist coming in and starting this. I like it! 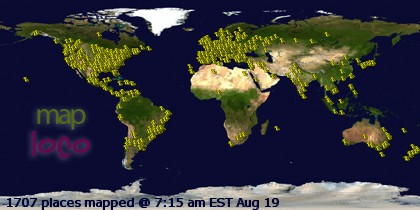 But I hope I haven't caught the CQ bug, it certainly seems to be infectious. These take a fair amount of concentration, referring to instructions, or require a sewing machine, so they are best worked on in my sewing room with the door closed and some nice music or an audiobook playing. What's the Celtic Knot Blanket, you say? That's a project I haven't posted about, and it's the only one I have left from Beating Around the Bush in 2009, two and one-half years ago. There are also far too many kits that haven't been touched and a few WIP's from ages ago. I shudder at the thought of even listing them. Oh wait, and then there is all the fabric I bought to make summer dresses for my granddaughter. If I don't get started soon, it will be fall. Where am I going with all this? While I think it's a good thing to have a few different projects going, eight is a bit too much. I think I'll try to list all of these on a project page and slowly work down the inventory to a manageable level. One of my big problems is that I'll have all of these projects going, and then something will pop up that I just Have To Work On. For instance, the Wee Care Gowns. I pleated the gowns I brought home from a Guild meeting, and was so frustrated by the way they were sewn that I just had to make a few more. The photo way up above is the second of these. And then there is another few potential projects rattling around in my brain that I will just have to start, so here I go again increasing my in-process inventory. What do all of you do? Do you start one project and see it through before starting another? Do you have just a few going at the same time? Or are you like me, with way too many project in work at once? Do tell! In the last post on the Waterfall Christening Gown, over two weeks ago, I was diligently ripping out entredeux and cutting off the too-tight roll and whipped edge from the hem band. That's about five hours of work wasted, and all from not paying attention to what I was doing. At least it's a recoverable mistake, and one that I'm not likely to make again. Here is the slightly narrower hem band with a nice, even roll and whip on both edges and the entredeux added to one long side. I was very careful to check my work as I progressed to ensure that I didn't pull the thread too tightly and make gathers again. Here I've started to add the lace. This is pretty easy! I'm using 1 1/2 length of lace to fabric, and divided both the fabric and the lace into eight equal sections. I pinned the lace to the fabric and pulled on the lace header to gather the lace to the fabric. It's really easier to do this by hand than by machine. I don't know about you, but I go crazy keeping the lace lined up to the entredeux under the presser foot, so I'd much rather sit and stitch it by hand. This also has the benefit of a nice, relaxing time of hand sewing and listening to a good audiobook. Now all that's left after the lace is to attach the hem band to the dress, work the buttonholes and sew on the buttons. Here I'm trimming the fabric from the entredeux that's attached to the dress so I can attach the hem band (the length without the lace edging). Then the dress gets a good long soak and wash. This poor gown is getting so grubby from all the handling. But that's what is so great about fine cotton, it washes beautifully. Then on to the bonnet, and maybe a slip, but that will definitely be by machine. I didn't get selected for Jury Duty this week, so I was able to smock the three tiny blue gowns I pleated earlier. The pleated wrinkles in the sleeves came out fine as I was able to smock over them. They smoothed right out once I removed the pleating threads and spritzed with water to remove the holes. The blue gowns made by my SAGA chapter tend to be a bit utilitarian, as all the edges are finished by serging. As I wanted to make something a bit more finished, I decided to make a few of my own gowns; the very tiny white gown is one. This was made from instructions in AS&E, Issue 97, and I'll discuss that in detail in a later post. This gown is the "Teeny Weeny" size, for a one pound (500 kg) baby. Doesn't it break your heart just looking at it and thinking of the tiny body it will clothe? Just to give you an idea of the size of this dress, the little bear measures nine inches head to toe. These bears are just adorable. Right now at work we are having our big fundraiser for USO. These bears are on sale for $6.00 each, which is pretty expensive for such a small toy, but the money goes to the USO's camp for the children of wounded Marines. We are near the Marine Corps Base Camp Pendleton, so our fund raising efforts go towards them. So far I've collected six bears, and now the ladies at work are dying to see them dressed up. So I'll make a few more to show off before donating the dresses. I'm now working on a slightly larger size of the white gown, and hope to have it finished tomorrow. I know I've provided this link many times before, but if you click on it, take the time to view the slideshow in the upper right hand corner to see the exquisite gowns, bonnets, and blankets the SAGA members have donated. Tomorrow, by the way, is Mother's Day here in the US, (and Australia, New Zealand and several other places). Happy Mother's Day to all of you! I'm off to meet several siblings and our mother for lunch today, as we all refuse to go to the ubiquitous Mother's Day brunches on Sunday. I hope to spend my own Mother's Day stitching away and talking to my two out of state chicks. I've made a bit of progress on the Garnet Bag, but not much. Right now I'm working on the petals around the lower flower, using a double row of chain stitch. After the second row is finished, the rows are given a raised center by whipping the two inner loops of the chain. I'm using a tapestry needle for this to keep from piercing the perlé cotton. Even if you never do any tapestry work, it's really useful to have these needles around. Here I'm starting to whip the third petal. So far this is the fourth variation on a chain stitch in this design, and I know there is at least one more. All have a different look to them, adding a lot of interest to the overall design with all of the variations. The center is a whipped spider's web surrounded by buttonhole stitching with the inner circle facing out and the outer circle facing in. The spokes of the wheels just barely overlap each other, making it look almost like a straight line from afar. Here is a shot of my progress to date. So far my favorite stitch is the wheat ear stitch in the interior of the large petals. Notice I used a Pigma pen to outline the darken the rest of the pattern. I just couldn't see with that pink pencil I had been using. This is so much better. Thanks to Gail for pointing out my mistake on thinking Deerfield embroidery was from Michigan. As Gail mentions, Deerfield embroidery originated in Massachusetts, quite a bit further north and east in New England. What got me mixed up was that I kept thinking of Greenfield Village, which is in Dearborn, Michigan where my grandmother used to live. We would visit her when we lived in Ohio many years ago and occasionally would go to the Henry Ford museum which was located in, you guessed it, Greenfield Village, part of Dearborn. As it turns out there is also a village called Deerfield in Michigan, which only adds to the confusion. I'm off to jury duty today and am bringing some very simple things to stitch while there. This is a very small bishop for our Wee Care program for our local SAGA chapter. Looks nice, doesn't it? At least it does from afar. But take a look at this photo. Do you see anything odd? That's right, no side seams! 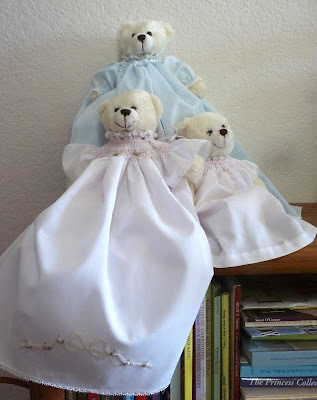 It seams that our chapter members who make the Wee Care gowns figure that it must be so much easier to make a gown without the side seams so the sleeve is set right into the gown. But whoever thought this up didn't take into account my less than perfect pleating skills. I brought three of these gowns home and decided to pleat them Saturday while I was alone in the house. The problem with pleating these things with the sleeves already sewn is that he sleeve portion has so much more fabric on the top than at the side seam, and invariably get it messed up as you can see in this photo. It took me two hours and three broken needles before I finished. And I know what the proper answer is: go slow and practice! Pleat lots of gowns! I'll smock these then make a few gowns myself - with side seams! I'd rather take the time to sew the seams if it makes the pleating easier. Each time I go to a SAGA convention I buy lots of lace from Luc Smiers, the lace merchant from the Netherlands. I'll use this tiny lace on my gowns. More on this later, gotta go! No, I didn't make this adorable bubble, but I'm going to! I attended a class last Saturday in which Kari Mecca taught how to make all the little flowers and bugs out of bullions. For most of the class we practiced, practiced and then practiced some more! Here is my doodle cloth with a lot of shapeless bullions, but I did manage a bow, ladybug, heart and a couple of cherries. If you look in the center of the photo, you can see the striped bullions, made with two different colors. Now, I never would have thought of that. I certainly like the effect, but they are a bit tricky to make. You need to really keep the wraps smooth with no twisting. and a wonky bee. The stripes don't quite line up as well as they could, but since it actually looks like a bee, it stays. This was my third try at it as it is. I think it will be fun making such long bullions and manipulating them into shapes. She gave us lots of tips, especially stretching the bullion out to keep it loose. Since I usually make bullion roses or other flowers, I tend to make them very tight. This will definitely be a learning experience for me. Every single item on the bubble is different, so I'll take photos and show them to you as I progress. The bubble will be a size 12 month, and my grand niece won't fit into it for another few months, so I do have some time to get it finished. Kari lives right here in Southern California, so it's pretty easy for us to book her to teach a class for our SAGA groups. She specializes in making children's patterns and clothes that aren't quite as frilly as standard heirloom sewing styles. Here is the link to Kari's website, please visit and check out her patterns and other goodies. Today is Saturday morning, the men are gone, I have laundry going, music on the stereo, and the day stretching before me. My only companion is the cat, and he just settled down for an eight hour nap in the linen closet. I'll spend some time organizing in the sewing room and putting away all the things I bought at the mini market Kari held. I did some major damage to her inventory! I bought a few of her tools she uses to make flowers, so I will try them out and show you my efforts in a future post.